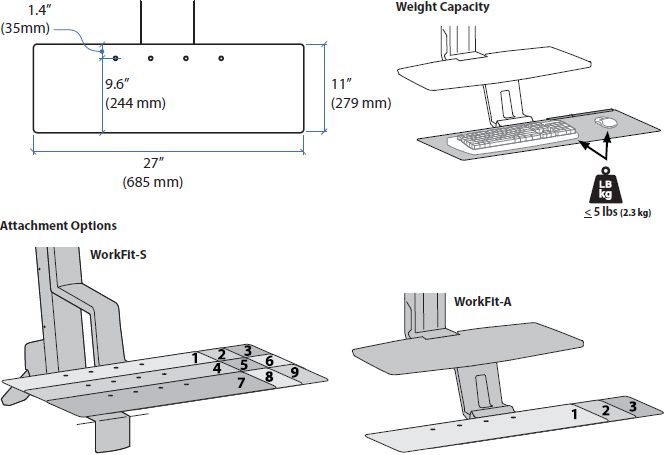 Upgrade your WorkFit-S or WorkFit-A workstation with a larger, extra-deep one-piece keyboard tray. Installs centered or offset to the right or left side to accommodate user preference. Built-in Touchpad which eliminates the use of a mouse: The integrated touchpad eliminates the need for a mouse and saves valuable desk space. The Glidepoint Touchpad puts computer control at your fingertips, allowing you to navigate, scroll, access files and enter data, all with just a light tough of the finger. Membrane key switch for fast and quiet typing: The low profile membrane key switch features more than a five million lifecycle, and it is designed with a silicone rubber material, which can reduce noise when typing, offering a faster and quieter typing experience. Compact 1U design: This keyboard is designed according to EIA-RS-310C specification, which can be mounted to any rackmount drawers and meets any industrial environment requirements. Keyboard Dimensions 15.75" x 9.25" x 1.25" (L x W x H). Package Dimensions: 16.75" x 11.75" x 1.5"